The design of business processes and structures for sustainable organizational success is my passion. 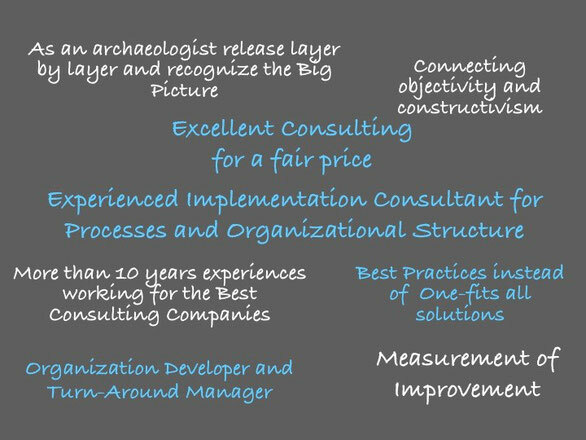 I'm a consultant and implementation companion and I am convinced that each concept is only as good as its results. How will our cooperation begin? Just drop me a message in the menu „Contact“ to arrange a personal interview. I will contact you immediately and we will arrange a first meeting. In the first meeting we will define an initial scope and arrange the details for the preliminary analysis. The preliminary analysis is the basis of cooperation and takes up to two days. The aim of the preliminary analysis is to concretise and identify the right areas for improvement. At the end of the preliminary analysis we will work together to finalize the approach, the expected benefits and you get a tailor made offer. Successful companies act in good time and ask for professional support.